You attend a workshop where the presenter sprinkles her content with references to texts that have influenced her ideas about the topic. You click on your favorite book-shopping site and begin to fill your cart. While standing in line, you overhear some strangers talking about a movie and you can’t help yourself, “Did you guys read the book?” you think, or maybe actually ask! Title and Author—Pretty self-explanatory to mention the title and author in a book recommendation, however, we might also teach kids to add the little details that often push a book from shopping cart to ‘buy now with 1-click’. Little details like other books by the same author or whether the book has been made into a movie. The Characters—We might pick up a book because the subject or storyline interests us, but we keep turning pages because we care about the characters and what happens to them. I recently finished binge watching the first season of Transparent. While doing the dishes, I found myself wondering when Ali would she stopping blaming her parents and start taking responsibility for her life. While driving, I pondered whether Maura/Mort would begin hormone therapy. Even flossing was not immune to thoughts of characters; when did Len turn out to be such a good guy? My point here is in narrative texts, it’s all about the characters. Let’s teach kids to transfer all the smart character work they’ve done for years to their book recommendations. The Events—While characters are compelling, many of our classes are filled with plot junkies; kids who turn pages with only one question driving their reading—What. Happens. Next. Choosing what events to share can be tricky. I knew I would ‘buy now with 1-click’ when I heard the amazing readers at the Bookrageous podcast recommend The Storied Life of A.J. Fikry by Gabrielle Zevin. They shared an event that happens very early in the story—an infant is abandoned in a bookstore. (As an adoptee, I am a sucker for a good abandonment story.) I think there’s a bit of an art to choosing which events to share in a book recommendation. Events that leave readers thinking, I want to know what happens, are great. Events that reveal too much or spoil the joy of discovery can leave a potential reader thinking, No need to read that one! Perhaps the best way to work on this is practice. The Audience—Simply put, audience can be reduced to “If you liked… then you’ll also enjoy…” (which, by the way, is exactly what’s stated my chart). However, I think one of the most powerful parts of book recommendations is that they can add new roads to our reading maps. A quick glance at my kindle reveals lots of one-book stacks, lots of things I’ve tried one of as a reader. For example, my love of fairy tales written for children led me to try When Beauty Tamed the Beast by Eloisa James, a fairy tale adaptation written for adults. There are no other fairy tales written for adults on my kindle, but I now have a new road on my reading map and who knows, maybe I’ll decide to blaze that trail in the future. Book recommendations can be an invitation to go off-roading in our reading lives. And, the way readers talk about audience can be that invitation. Maurice Sykes says that invitations are more compelling than assignments. I couldn’t agree more. Let’s invite our students, our friends, our families to read more and more and even more by teaching, practicing and becoming more expert in the art of recommending books. I love that you are tapping into the power of social capital in the classroom. The peer to peer relationships in our classroom will be enhanced when books are at the center of the conversation. 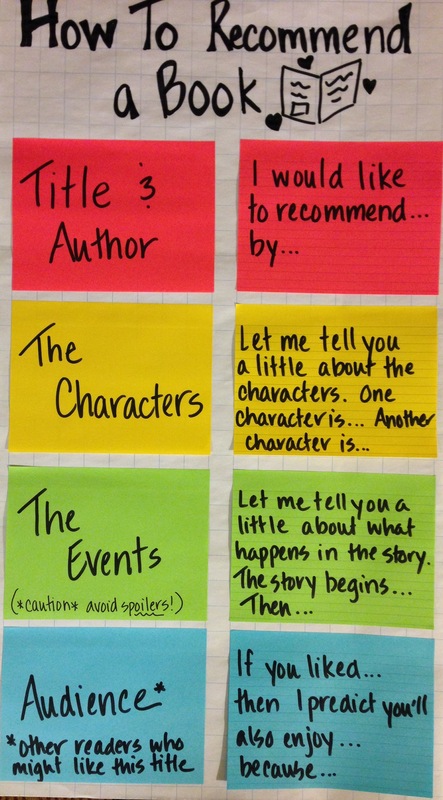 Thank you for sharing clear, explicit moves (and chart love) for helping students author more powerful book recommendations. I can’t wait to check out the podcast from Bookrageous — adding it to my Podcasts to Listen To list. I’ve been paying attention to the ‘engage-o-meter’ when kids talk about reading and books. I’ve noticed that they are most authentic and most engaged when recommending their must-reads to others. Bookrageous is awesome! Two of this year’s favorites reads came from them–The Storied Life of A.J. Fikry by Gabrielle Zevin and All the Bright Places by Jennifer Niven. They haven’t produced a podcast in a while (I hope they return soon), but there are plenty of episodes to listen to in the archives. I’ve been thinking a lot about engaging readers to be…well, readers, and over and over the biggest recommendation is to do book talks. Donalyn Miller, Penny Kittle, Steven Layne all say the same thing, that exposure to new books is SO important. However, I like that we can transfer that responsibility to students. Real readers recommend and talk about books. So, if our goal is to create life-long readers, students need to learn how to do that. It is definitely a skill worth teaching! Also, just as a teacher can “bless” a book with a recommendation, imagine what a peer’s influence might do. What a community would be created! This is great! Love the chart! I don’t support my kiddos enough in the How-to department with book recommendations. Frankly, I think the actual writing of a book recommendation is difficult (especially in the spoiler department). This really breaks it apart for kids and me! Thank you, Shana!